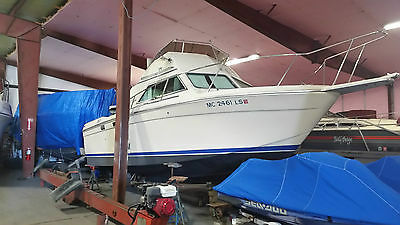 1982 Chris Craft Corinthian 263 26' Dual V8 Boat..... this is an absolutely give away price! I have two boats and cannot keep both. For local pick up only. does not come with a trailer. Being sold "AS IS".......I have had someone inspect the stringers and transom and they look and sound great. Overall nice condition with no major damage. Strong running dual Chevrolet V8's....great oil pressure...runs and shifts well. Is currently winterized and sitting in indoor storage at Barrett Boat Works in Spring Lake Michigan. In 2013 this boat was registered as a commercial fishing boat. This boat can be viewed at Barrett's by appointment only. $500 deposit due within 24 hours of auction end and can be made through PayPal. Full payment due within 5 days of auction close and must be cash or certified funds....no PayPal. This boat is for sale locally and auction will be ended if I secure a Buyer. If you purchase this boat I will keep in indoor storage for up to 14 days. After 14 days you will be responsible for any storage costs incurred. 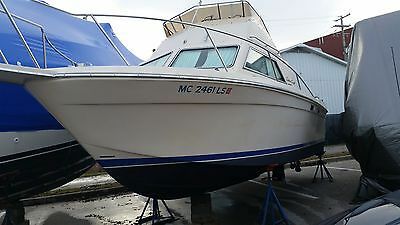 1982 Chris Craft 263 26' Dual V8 Boat For local pick up only. does not come with a trailer. Overall nice condition with no major damage. Strong running dual Chevrolet V8's....great oil pressure and shift well. Is currently registered and winterized.......... sitting in dry dock at Barrett Boat Works in Spring lake Michigan. Storage for the winter and put in or placement on a trailer is paid for and included. In 2013 this boat was registered as a commercial fishing boat. This boat can be viewed at Barrett's by appointment only. $500 deposit due within 24 hours of auction end and can be made through PayPal. Full payment due within 5 days of auction close and must be cash or certified funds....no PayPal. This boat is for sale locally and auction will be ended if I secure a Buyer.